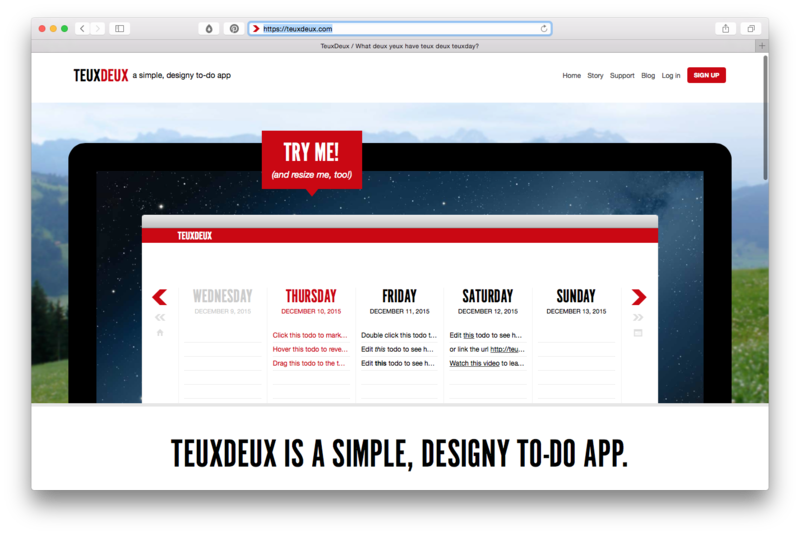 TeuxDeux was born over a lunch conversation where I shared my vision of a calendar based to-app and 3 days later we had a working prototype. 5 years and several updates and revisions later, TeuxDeux is helping keep thousands of happy user stay organized. The secret is to keep TeuxDeux as your browser landing page, so every time you open a browser window you are being reminded what you should be working on. 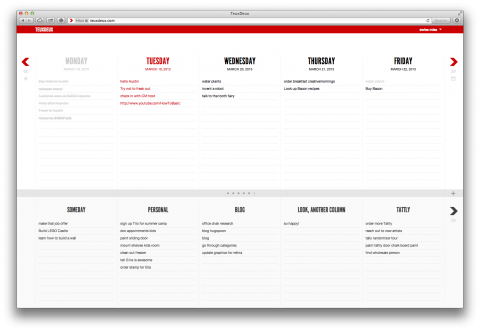 Organize your to-do’s on our simple, list based calendar view. Cross off what you’ve completed and whatever you don’t cross off, will automatically move to the next day. You can also create your custom ‘someday’ columns on the bottom area for the things that you just need to get out of your head. And, take your to-do’s with you on the go, with our iPhone app. Happy 5th birthday TeuxDeux. I don’t know what I would do without you. An app that is tricking me into saving? I am down with that. Might give this one a try: Digit. Exobrain is a Brainstorming tool and interactive web application that lets you visualize your thoughts, finds unique connections between words, and pushes past obvious ideas. Reminds me of my Visual Thesaurus days when I was the Design Director at Thinkmap. 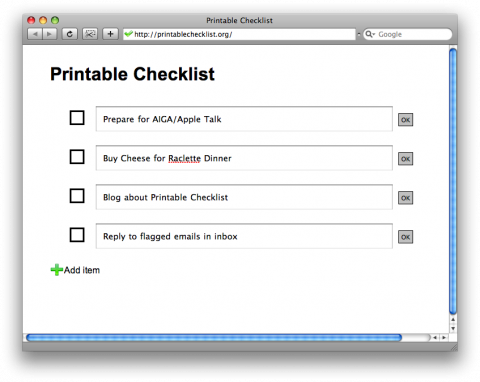 I agree with Tom: Printablechecklist.org is a ridiculously simple online printable checklist creator. Lucky me, ‘productivity guru’ Scott Belsky, founder of Behance Network, gave me a personal demo of their recently launched new tool called Action Method. The “Nag” and “Appreciate” feature made me chuckle: If you need to send a message to your co-worker about finally getting you that document you’ve been waiting for, you can send him a 140 characters ‘Nag’ system alert. And the ‘statistics’ feature will make many studio managers happy; with a click of a button you see what’s been done (or not). Hat tip off to the Behance team. 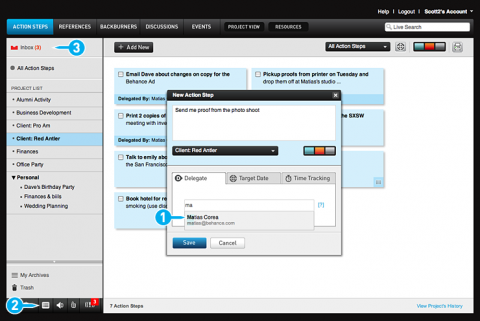 Action Method is a refreshing new approach to productivity, featuring a clean, intuitive user interface. I am impressed! And knowing this is just the start, I am curious to see the improvements Scott and his team will make over the coming months. Take the Action Method Tour! The typical creative process for managing ideas and projects is haphazard. Many creatives lose energy amidst unclear tasks, half-finished thoughts, ideas with ambiguous next steps, cluttered references, and little follow-up in a team environment. “Action Method” tries to bring order to the organic creative process we all use in our work.